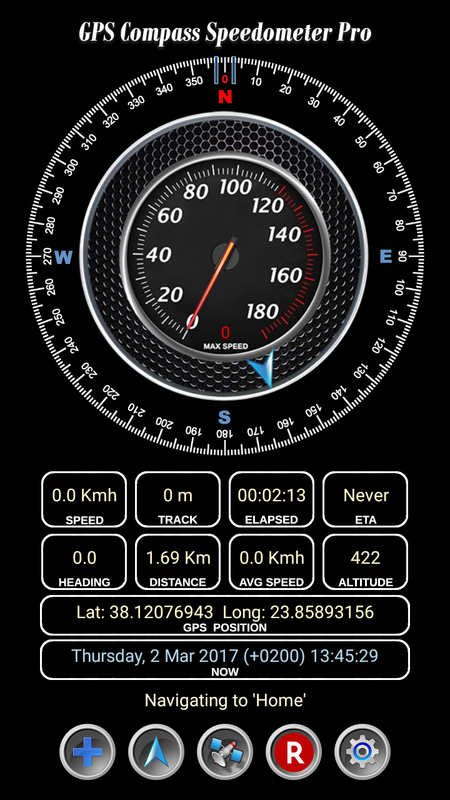 GPS Compass Speedometer Pro knows your heading, location, track distance, ETA etc. and can navigate you to saved waypoints easily. The power of this app is that you get almost all the functionality and information in one screen. This makes it easy to use while driving for example. Save a waypoint just by using one tap and rename it later in your convenience. - Compass heading. Magnetic or GPS mode. - Arrow showing bearing to destination. - Current, average and maximum speed. - Track distance which is the travelled distance since last reset. - Elapsed time since last reset. - ETA (Expected Time of Arrival) and remaing time to reach destination. - Distance i.e. remaining distance to destination. - Current position in Latitude-Longitude decimal format. - Current Date and Time as well as Sunrise and Sunset times. - Address at current location. - Option to switch between Metric and Imperial units. 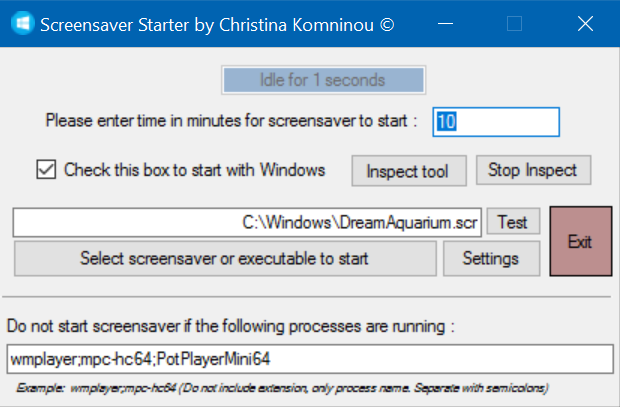 This nifty program allows you to start your screensaver without using the built-in mechanism of Windows. 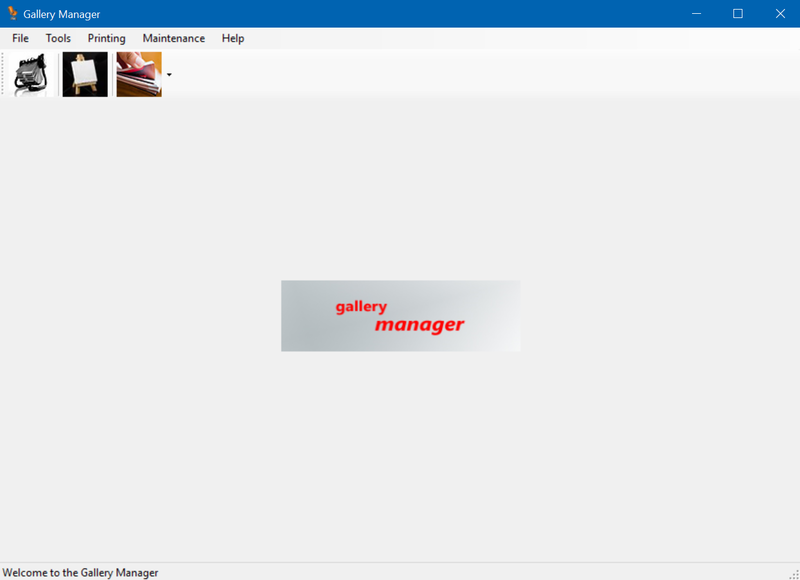 It provides a system tray icon to start your screensaver instantly by right-clicking on it. If you want to prevent the screensaver from starting (e.g. when playing video) include the process name in the list provided and separate processes by using a semicolon. Tip: If you get an error when clicking 'Check this box to start with windows' run the program as administrator. A very useful program for netMod owners! Change all your netMod settings using this simple and easy to use interface. Save setting profiles to your netMod memory with one click. 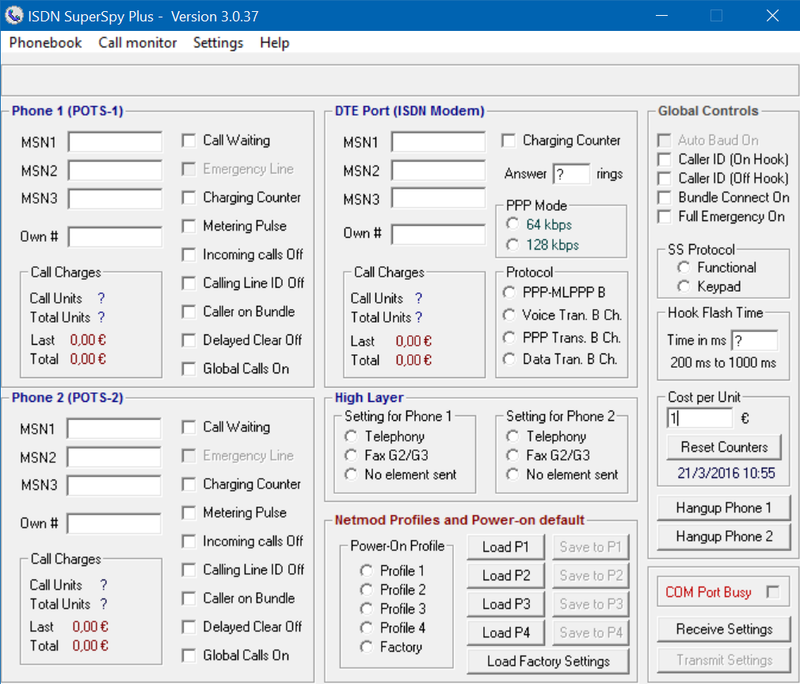 A caller ID feature is available to monitor all calls even when your line is busy. You get a phonebook to organise numbers and get caller ID with photos. A serial port which is compatible with the Microsoft serial com control. Built-in com ports almost always are compatible. Calculate the value of ancient greek words or phrases with this easy to use calculator. In the standerd mode all ancient Greek symbols are available. A special decrypting mode is available. 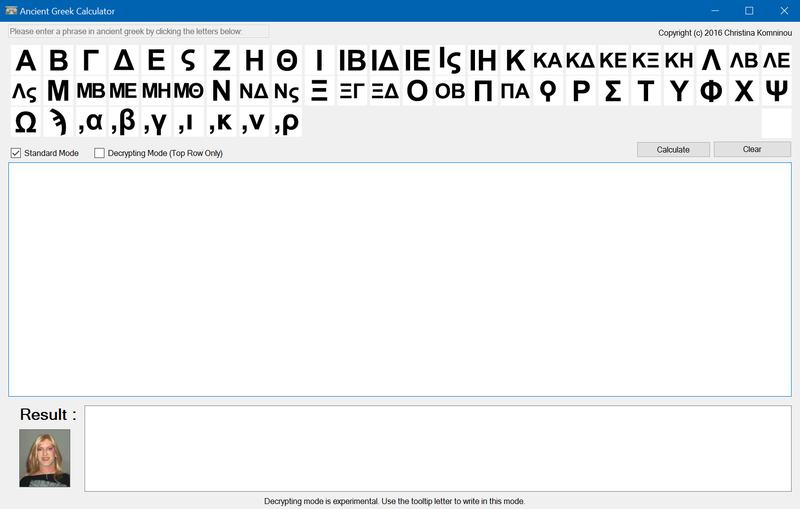 In this mode only the top row (the 24 letters of the modern Greek alphabet) are available and the letter typed is the one shown in the tootip. Feel free to play with the decrypting mode and discover what results you get. Designed to facilitate the management of works of art in Greek galleries. Keeps track of artists, clients etc., prints labels in specific categories and stores financial data for sales. A simple report can show you what your profits are in a specific time period. Do you know that the only correct astronomical sync of our calender with astronomical time is after the correction on February 29th every four years? This is the reason why we have leap years to correct the error. This happens because you cannot divide a year into days exactly, which means that astronomically new Year is not at 12:00am! 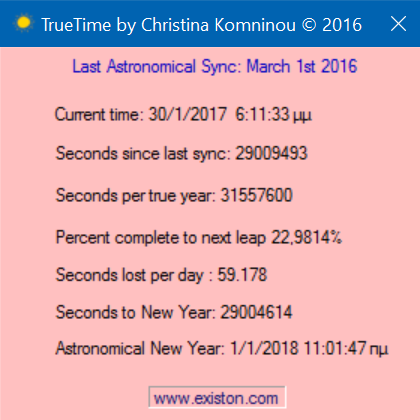 Use this little program to find the true new year and accurate times since the last astronomical sync. Wonder at what distance your device is retina? Just run this app! If the retina distance is less than the typical viewing distance then your display is retina. 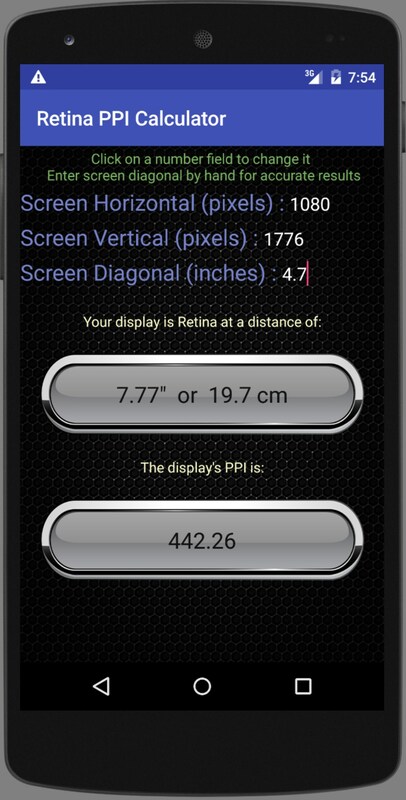 You can calculate retina distance and PPI for any device. - Retina is the distance at which the pixels are so small that they are no longer individually visible. - All displays are retina given enough distance. Therefore what really matters is actual viewing distance. - The calculation uses a value of 60 pixels per degree (PPD) for defining retina. Sometimes a lower PPD is used for retina calculation as low as 57.5 PPD. - Most people will perceive displays as retina at a smaller distance than the one calculated by the app because the 60 PPD definition assumes perfect vision.